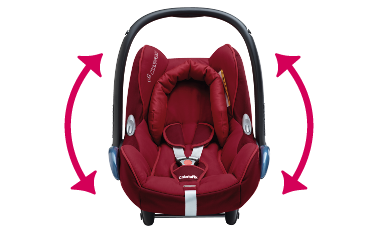 The Maxi-Cosi CabrioFix is a car seat for babies up to 13 kg (from birth to approximately 12 months). The Maxi-Cosi CabrioFix must always be installed in a rearward-facing position. 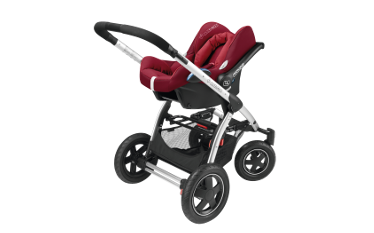 The seat can be fitted using a standard 3-point car seat belt or can be used in combination with the Maxi-Cosi 2wayFix, FamilyFix, or EasyFix . Always check the car fitting list at www.maxi-cosi.com before purchase. 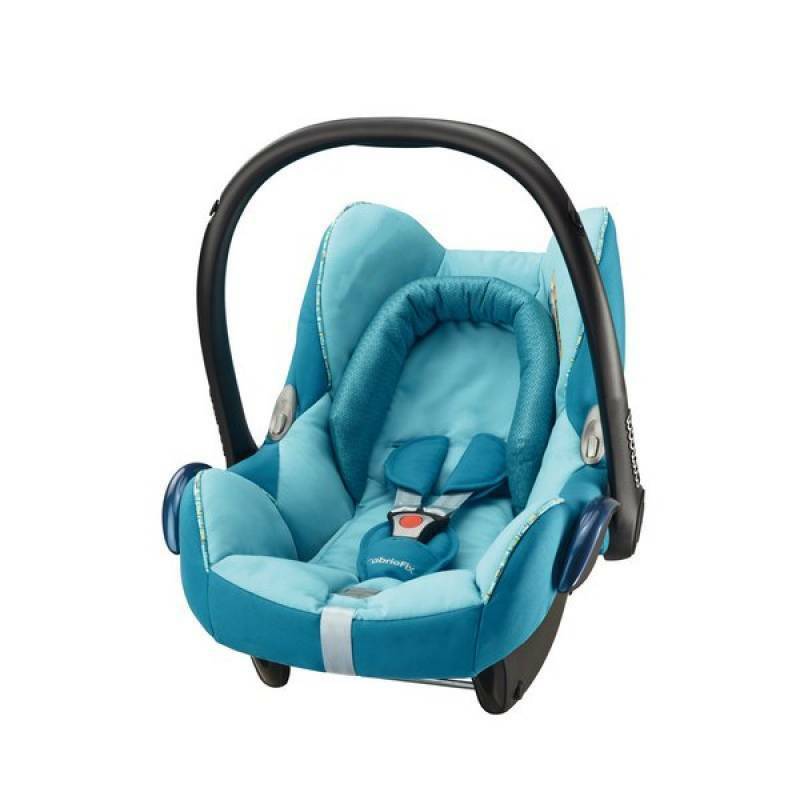 This car seat is an excellent choice in terms of safety, comfort and ease of use. Without disturbing your sleeping baby, simply transfer the lightweight CabrioFix from the car to one of the compatible Maxi-Cosi or Quinny pushchairs or strollers. Suitable for babies from birth to 13kg (approximately 12 months). Optimal safety and easy to install in your car in combination with Maxi-Cosi’s 2wayFix (ISOFIX), FamilyFix (ISOFIX), or EasyFix Base (ISOFIX/belt). Side impact protection for optimal protection in the event of a side-impact collision. When not in the car, it can be combined with most Maxi-Cosi and Quinny pushchairs and strollers. 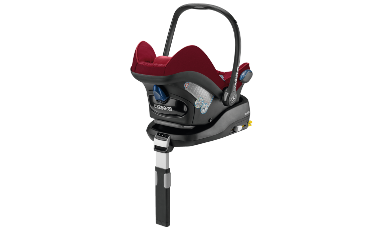 Comes complete with a padded insert for newborns (removable), harness belt pads, integrated sun canopy and headhugger. Convenient hooks to hold the harness out of the way. Ergonomic handle makes it easy to carry. Complies with European safety regulations ECER44/04. We do not have a car but had to buy a seat coming back from the hospital after my daughters birth. We chose this car seat as we have the out'n'about nipper pram and this had the option to fit the car seat on the pram. We only use the seat for when my daughters grandma comes down and we go to the shops or during hospital visits. It's so easy to use and my daughter doesn't take long to fall asleep in it. It fits all the requirements. It is easy to use. The only bad thing i'd have to say is I think the instructions should be clearer and not just pictures so I don't have to refer to the website every time I need to know something. Pretty straight forward to use, but when looking for details on specifics (i.e. When to remove newborn insert), the instructions are useless. Just a bunch of badly drawn pictures. On 25th May I was unfortunate to be involved in an accident with my 9 month old daughter in the car. The Maxi-Cosi Cabriofix seat and isofix base worked their magic and she was absolutely fine. I contacted Maxi-Cosi to ask whether I should replace the car seat and to my amazement they told me they could offer a replacement free of charge. Today my old seat and base were collected by DPD and replaced with a new seat and base. The customer service I received was outstanding and I cannot thank them enough. I'm really kicking myself now for not buying the Pebble seat ready for when my daughter moves to her next seat. I highly recommend Maxi-Cosi not only for the quality of their products but for peace of mind should you ever find yourself in the same situation. Thanks again Maxi-Cosi! We were in a car accident and my baby was completely unharmed, despite other passengers suffering injuries. Not only is it great day to day, but it works when you need it most.